Before I begin, I want you to know what these Islands, the place I call Paradise, means to me. This is a very personal journey that I share with you in these pages. These enchanted islands have been my home and that of my family for three generations. They are, to me, a constant source of joy, mystery and delight. I have only one way to describe my connection, passion and commitment to the Galapagos Islands: I love it here. I love knowing that underneath the sea there is life and that life is what created the land in which I live. 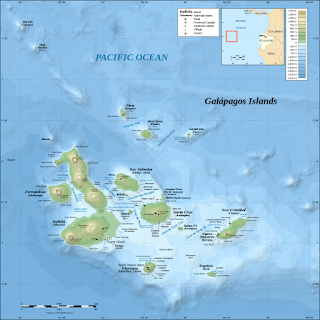 The Galapagos Islands are located in the eastern Pacific Ocean approximately 600 miles (1000 km) off the west coast of South America. The closest land mass is the mainland of Ecuador to the east. 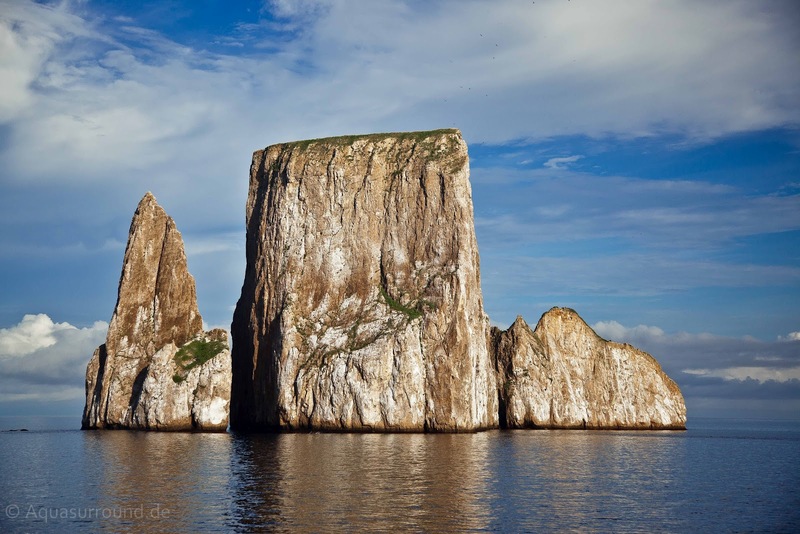 There are 13 major islands within the archipelago and hundreds of smaller land masses or rocky outcroppings. 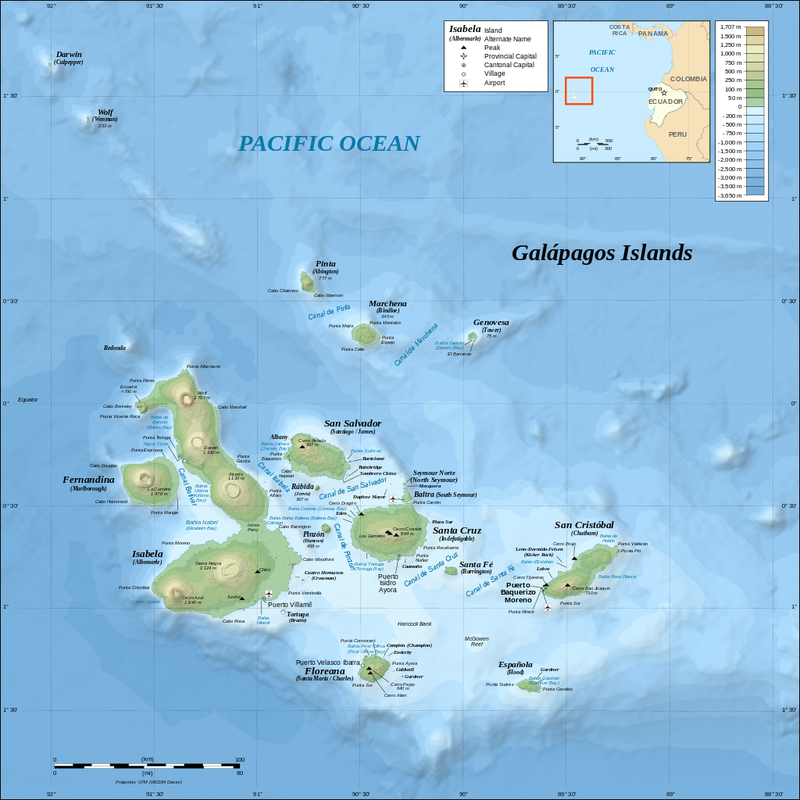 The Galapagos Archipelago consists of 4,897 square miles (7880 square km) of land over 28,000 square miles (45,000 square km). Only four islands are inhabited by humans and the total human population numbers about 30,000. The fewer the human inhabitants, the greater the likelihood that the endemic populations of animals, bird, marine life, flora and fauna will survive unaffected by non-natural phenomena. The Galapagos is a fragile environment and has seen encroachment from both expected (human) and unexpected (cats, goats) sources. 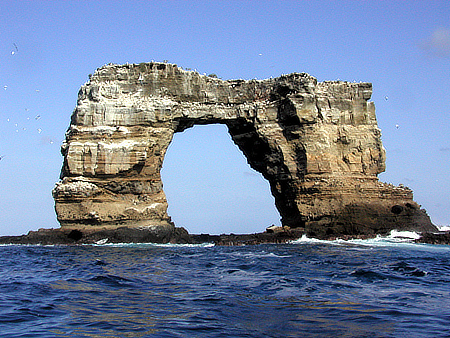 One of the most fascinating aspects of the Galapagos Islands is, to me, their geological formation. This is an area I particularly enjoy explaining and teaching to my groups because the changes are continuing to happen. When we look at the sea, we observe it moving, changing, ebbing, flowing. We watch birds floating across the sky, ever in flight, ceaseless in their energy. The sea lions, even when lazing on the shore, are moving, restless, playful, changing. The tortoises wend their way slowly and solemnly from place to place - still moving and evolving. 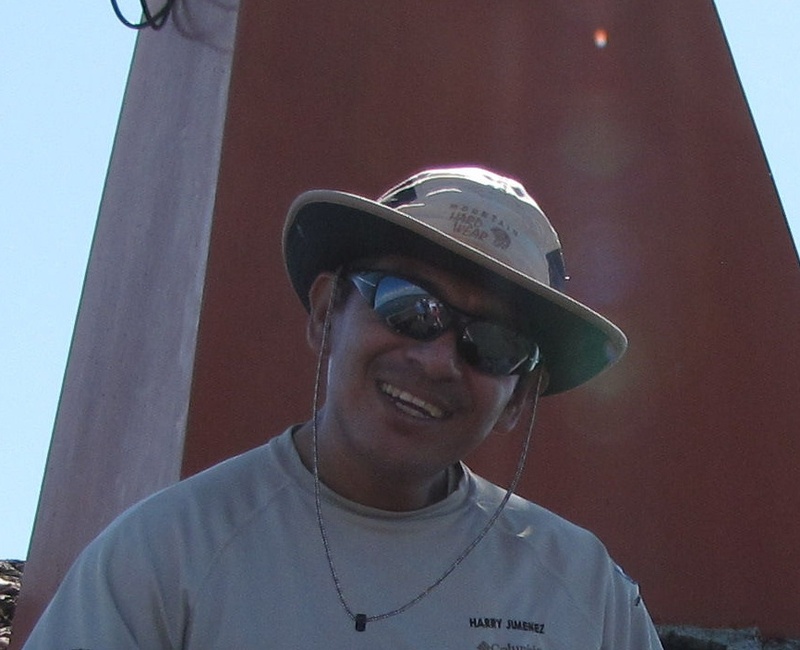 So are the multitudes of other animals, birds and sea life that we encounter every day on our quest and journey for adventure and knowledge in the Galapagos Islands. Though we may not experience that same shifting energy when we are standing on a land mass that seems solid under our feet, that experience is merely a false sense of security. In truth the Earth underneath our feet is varying, moving, yielding, stretching, rising, falling, changing temperature and growing. Nature is not stationary, but active and dynamic. The Galapagos Islands are as vibrant and forceful under their surface as on the surface itself. When we talk together about this magnificent phenomenon, our eyes are opened again to something new and wondrous. 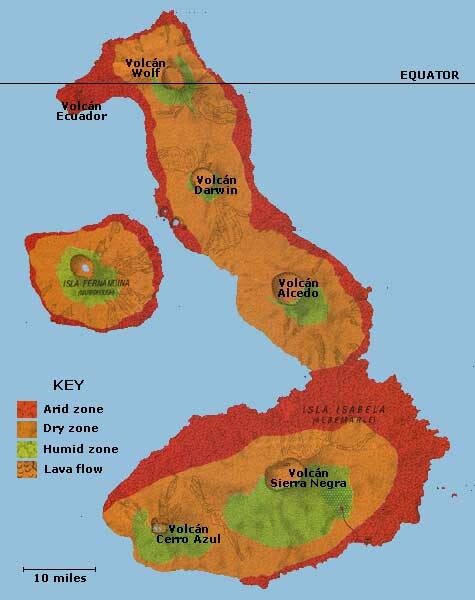 Each major island, with the exceptions of Isabela and San Cristobal, was formed from a single volcanic eruption. Isabela represents the union between six different underwater volcanoes, all connected on the Pacific Ocean floor. 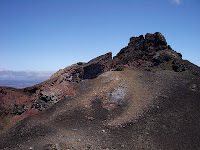 (Read my post about hiking these dynamic volcanoes here.) Explained simply, throughout the area known as the Galapagos Islands' Land Reserves and Marine Reserves, monitored and overseen by the Galapagos National Park Service, the sea floor bubbled up and erupted forming volcanic land masses above the surface of the water. These land masses formed the Galapagos archipelago. Why the sea floor erupted and formed the islands is described by the movement of the tectonic plates. The theory of plate tectonics explains the process that created these remarkable Islands. The earth’s crust is formed by huge plates that move slowly but inexorably against one another at a rate of about 5 centimeters a year. When plates moving in opposite directions collide, the land rises up and forms a new mass. This process occurs in various places throughout the world. 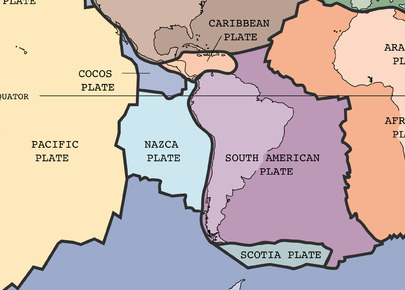 The Galapagos lie in the area where the Nazca plate (moving east-southeast) and the South American Plate (to the west) and Cocos Plate (to the north) engage in a challenging process of passing under and above one another. At the point of merger, huge submarine mountain ranges are built. The denser plate pushes from underneath and, ultimately, upward through the upper crust (the lithosphere), forming a mountainous ridge. It is at this location that magma occurs and a volcano erupts at what is known as a hot spot. A hot spot is an area of intense heat within the Earth’s core. The eruptions that created the Galapagos Islands occurred millions of years ago and continue to occur even today at the hot spot locations. A hot spot is the location where magma burns through the earth’s mantle to reach the surface. In the case of each of the Galapagos islands (as well as hundreds of identifiable rock upcroppings that are now majestic tourist sites for photography, contemplation, SCUBA diving and snorkeling), the magma pushed through the crust on the ocean floor. Because this occurred underwater, the magma cooled quickly and started forming a land mass, at first under the sea. The process repeated and repeated until, over time, the built up material emerged above the surface of the ocean. 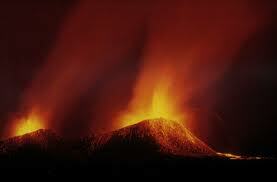 The magma forced its way to the surface through successive eruptions over hundreds of thousands of years. In this manner, a land mass and, eventually, an island was formed. Conceptually, the plates move above the hot spots, but the hot spots themselves do not move at all - they are stationary. 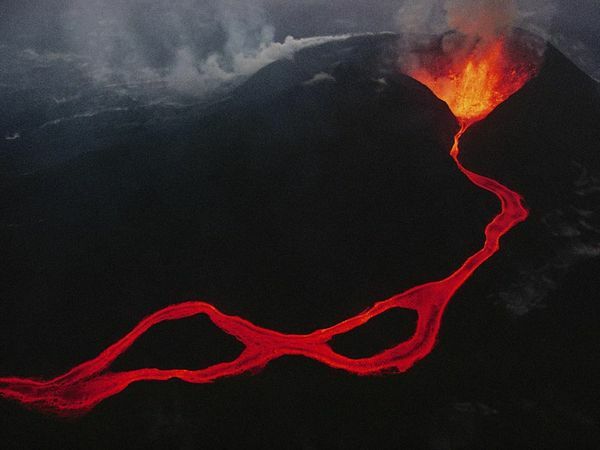 This suggests, and the geology of the Galapagos Islands proves, that the process repeats itself each time the plates collide over a hot spot, eventually forming a chain of volcanoes of different ages. The plates collide and move eastward. The hot spots now have a different area of the ocean or of earth above them. 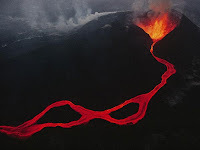 Thus, each volcano’s size and location within a chain reveals the age of the land mass and how long it remained over the hot spot. 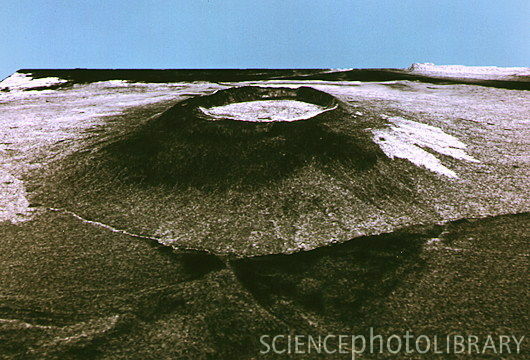 A volcano remains active (as opposed to extinct) for as long as it is above the hot spot. If the plate shifts, the original volcano moves away in an easterly direction and becomes inactive because it is no longer near the hot spot. Eventually, the hot spot will again erupt, forming a new volcano. The hot spot that formed all of the islands within the Galapagos archipelago started out by creating our eastern-most islands like San Cristobal. Now it is now located near Fernandina and Isabela. The hot spot is estimated to be about 100 miles wide. As the islands move away from the hot spot, or volcanic plume, the volcano from which the land mass was generated becomes extinct, meaning that it no longer erupts, but the land mass and evidence of earlier volcanic activity remain. Cooling and contraction follow extinction. Scientists have found evidence of land masses within the archipelago that are now totally resubmerged into the sea. 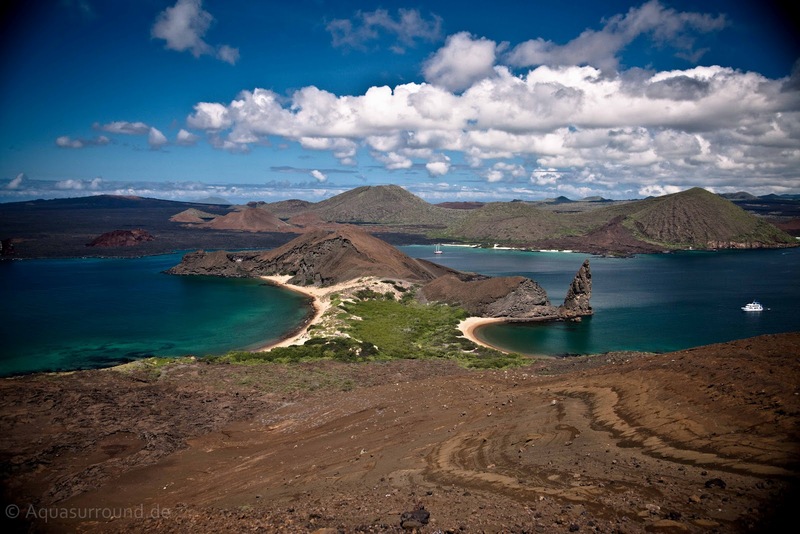 It’s speculated that the hot spots beneath the Galapagos may be 90 million years old. This fact, of course, is fundamental to our ultimate understanding of origin and evolution as informed by the Islands as a whole. 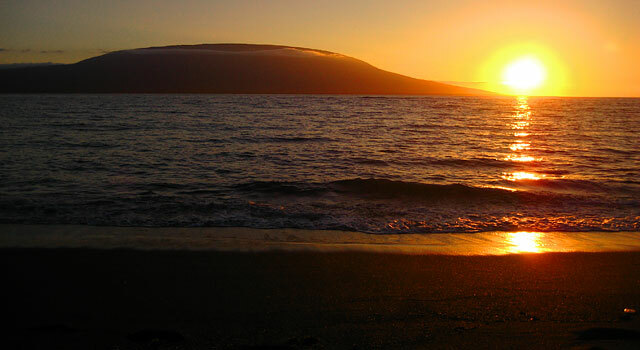 The oldest islands in the Galapagos, those that have moved furthest away from the plume or hot spot, are the most eastern. The oldest island is Espanola. Fernandina and Isabela - to the west - are the youngest. Still even Espanola is relatively young in geological Earth ages; it is only 3.3 millions years old. 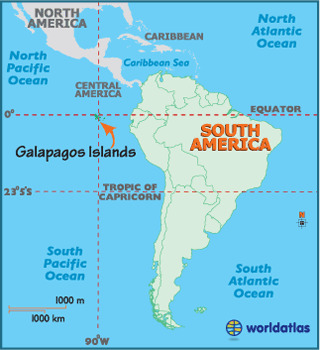 Most of the Galapagos is less than 1,000,000 years old and Fernandina, the youngest, has been around for only 500,000 years. The most recent eruption on Isabela was in 2005 and on Fernandina was in 2009. Visitors to Isabela will see steam rising from its active volcanic cores. Today’s most active volcanoes are on Fernandina, Isabela, Pinta and Marchena. When you walk on the islands, you can readily detect their relative ages by the degree of erosion on the surface of the island. The trails on the eastern islands are generally much smoother than those to the west as they have seen more erosion caused by wind, water, animals and humans. The Galápagos Islands are wondrous and beautiful. They are enchanting, engrossing and ever-changing. They offer a dream landscape for photographers, a world of thoughts for poets and an immersion into a wonderland for everyone who visits them. But perhaps most of all, they epitomize a microcosm of Earth's recycling of itself through the birth of volcanoes, growth through eruptions, and death by gradual erosion into the sea. When you place yourself and your mind in the midst of this beauty and drama, try to close your eyes and imagine the world beneath your feet as well. It too is beautiful, dynamic, and evolving. Plate tectonics is the unifying theory of geology that describes and explains that all earthquakes, volcanic activity, and mountain-building processes are caused by the gradual movement of rigid slabs of rock, called plates, that make up the Earth's surface layer. Tectonic plates are not just theoretically important. Tectonic activity recycles the material of the Earth. Plate movement keeps the Earth ever-changing and from stagnation. Tectonics creates heat - the very heat necessary to recycle life as we know it. Tectonics creates new surfaces on the earth. It creates opportunities for new plant and animal life. Tectonics is the most elemental geological concept to understanding not only the Galapagos Islands, but, in many respects, the essence of what keeps our planet alive. For more beautiful examples of what plate tectonics does to the earth, take a look at the National Geographic Photograph library. To learn more about the Galapagos Islands, there is no better source than the BBC's series called Born of Fire, three videos available on Youtube. 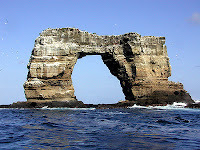 I sincerely recommend them to anyone who seeks an awe-inspiring view of my home - the Galapagos Islands.